When you combine the world of social media and networking with the world of entertainment and celebrities, you are almost always bound for success. Ever since Twitter first came out and more celebrities have joined their network, it’s now been easier than ever for average every day people and fans to connect with their favorite celebrities all around the world. 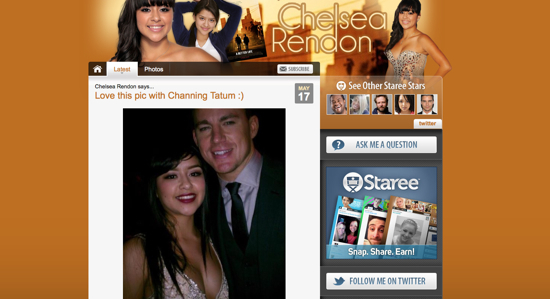 A new social web site and mobile app just went live today, called Staree. The concept behind the site is simple, it’s a great combination between Instagram, Twitter and blogging all meshed together. Since Staree has a mobile app, you can easily snap photos and videos, then send them directly to your Staree page. Even thought Staree just launched today, they still have a nice amount of celebrities that are currently using the web site. It’s quite obvious that this number will rapidly grow and increase, especially since Staree is owned and operated by Izea, which also runs SponsoredTweets… which has a massive celebrity user base. You can see a screenshot of what individual celebrity and Staree users pages look like below. As a member of Staree you can instantly add updates, images and video right to your page. As a visitor and user of Staree, you can easily ask a question to the owner of the profile page, contact them through Twitter, or leave a comment directly on their page. Staree is currently accepting new members and right now are focusing on higher end profiles and people with a large following among the major social networks. You can apply at their web site right now. Should You Globalize A PPC Campaign?